The antiques experts at Kovels.com have just released their newest special report, Kovels’ Collectors Guide to Handbags. This report includes pictures, prices, histories and marks to help wise collectors and the people who just love designer bags. 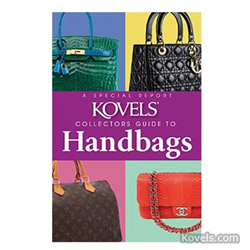 Kovels’ Collectors Guide to Handbags, a new special report from the Kovels, is here! Kovels’ Collectors Guide to Handbags is a concise report on the most popular brands on the vintage market. Learn how to spot the thousand dollar plus bags that are regularly found as bargains at garage sales and thrift stores. Discover the origins of well-known brands like Hermès, Christian Dior and Judith Leiber as well as the more affordable labels like Liz Claiborne, Vera Bradley and Coach. Identify a bag as one of the “collectible” bags using the marks and information on over 75 brands. Learn the critically important information to help spot fakes. Know what to look for when collecting handbags. And included with the report—a free supplement listing more than 200 current vintage handbag prices. Know what to look for when collecting handbags. Now is the time to build a collection, while prices of some “undiscovered” brands are still low. Learn which bags are the most coveted and copied vintage bags on the market. Kovels’ Collectors Guide to Handbags is available only from the Kovels at KovelsOnlineStore.com. Terry Kovel is America’s foremost authority on antiques and collectibles. She is the well-known columnist and author of more than 100 books on antiques and collecting. With her daughter, Kim Kovel, she co-authors the best-selling annual Kovels’ Antiques and Collectibles Price Guide. The 2016 edition is available at Kovelsonlinestore.com and local bookstores. They will discuss antiques and collectibles topics with accredited media. Photographs are available. Contact pr(at)kovels(dot)com. Kovels.com, created by Terry Kovel and Kim Kovel, provides collectors and researchers with up-to-date and accurate information on antiques and collectibles. The company was founded in 1953 by Terry Kovel and her late husband, Ralph. Since then, the Kovels have written some of America’s most popular books and articles about antiques, including the best-selling Kovels’ Antiques and Collectibles Price Guide 2016. The website, Kovels.com, online since 1998, offers more than a million free prices, and includes a free weekly email, “Kovels Komments.” It gives readers a bird’s-eye view of the market through the latest news, auction reports, a Marks Dictionary, readers’ questions and answers and much more.